This A.R. True 14 foot LOA sailing skiff/dory was rescued from decades forgotten in a barn in 2010 and spent the next four years being stripped, refastened, and recaulked. The lower half of the transom was also replaced. Both of the cotton sails and the mast and boom are original. 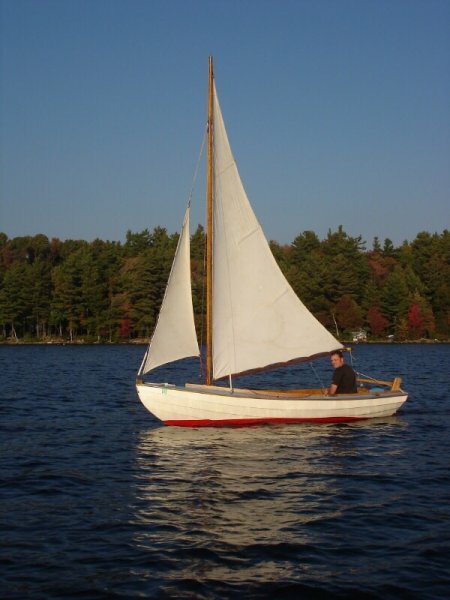 Seabiscuit (named, tongue-in-cheek, after the racehorse who also had an inauspicious start) now sails on the lakes of southern New Hampshire. Its owner, Mike Wozmak, can be contacted at mwozmak@gmail.com if you have any information about the date or lineage of this boat.